Photograph depicts an unidentified man giving a speech at a podium. 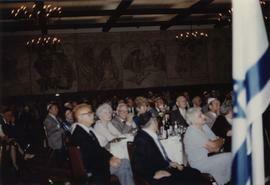 Photograph depicts the people attending B'nai B'rith's 75th anniversary celebrations. Photograph depicts four unidentified men behind a table with a banner and birthday cake. 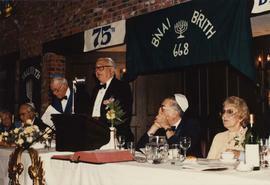 Photograph depicts a group of unidentified men at the 75th Anniversary dinner for B'nai B'rith Lodge #668. Photograph depicts people attending the Diamond Jubilee banquet of B'nai Brith Vancouver Lodge 668.Written on the verso: "3 cols x 3 " deep. 3 cols wide # " deep. Page 7. BB Vancouver Lodge. Oct 20 1972. 65%." Photograph depicts people seated at tables. Photograph depicts four unidentified people seated at a formal dinner for the 75th anniversary of B'nai B'rith Branch #668. Certificate to commemorate past president Ann Fromson Muskovitch on this 60th anniversary of B'nai B'rith women, February 20, 1988. Photograph depicts the people at the head table standing.Written on the verso: "17A. Sept. 4/85. Lion's Gate B'nai B'rith. Sept. '85." Photograph depicts the people at the head table standing.